The GreenScapes Landscaping Company has a 42-year history of landscaping in Columbus and an ongoing commitment to gardening, landscape design and horticultural projects in Central Ohio. This commitment is not only manifested in the desire to be Central Ohio’s best landscaping company. The award-winning landscape design and landscape architecture firm is deeply involved in charitable work as well. For decades, GreenScapes founder and president Bill Gerhardt has supported a host of community organizations. One that is particularly close to Bill’s heart is the Franklin Park Conservatory and Botanical Gardens. Franklin Park Conservatory is a jewel, a true national treasure, right here on the near east side of Columbus. Some still associate the conservatory with 1992’s Ameriflora event, but there is so much more to see and do there today. The buildings and grounds have an astonishing array of floral, horticultural and landscape displays. The park surrounding the conservatory has a huge variety of trees and shrubs, and the landscape designs, water features and green spaces are captivating year-round. Some of the conservatory’s programs, such as the Growing to Green community gardening program, are national in scope. Franklin Park Conservatory’s calendar is always full of family-friendly activities and educational events. It is one of the focal points of the region for gardeners and landscapers, as well as people who just want to see beautiful landscape displays and learn about plants. The conservatory draws national and international visitors and sponsors a variety of landscaping and garden programs and community outreach projects. What Won’t We Do for the Conservatory? Since 2004, Bill and GreenScapes have worked with the conservatory to further community gardening programs, help beautify the buildings and grounds, and provide landscape design ideas, landscaping labor, materials and horticultural expertise whenever and wherever needed. 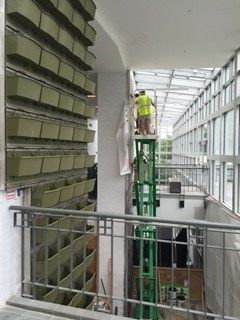 His landscaping crews have helped create and install gardens and water features, and built the GreenScapes Live Wall at the conservatory’s main entrance. In addition, Bill and Greenscapes have funded a myriad of programs. In 2009, GreenScapes Landscaping designed, installed and donated the “Live Fire Theater,” an outdoor kitchen showcasing five ways to cook food over an open fire, held in the conservatory’s Scott’s Community Garden. In 2015, the William Gerhardt Family Foundation donated the entire entry garden at the Wells Barn area of the conservatory. The “Mom’s Garden” was dedicated to the memory of Bill’s mother, Eleanor “Jeannie” Gerhardt. In the beginning of their involvement with Growing to Green, GreenScapes and the William Gerhardt Family Foundation donated materials and landscaping services. But, after Bill attended his first Growing to Green community gardening meeting and heard firsthand the tremendous impact that community gardening was making in people’s lives, “it confirmed to me that I needed to be more involved at the conservatory.” Bill became a major donor to the Growing to Green Program in 2006 and joined the board of trustees at the conservatory that same year. Growing to Green has established over 300 community gardens in Central Ohio neighborhoods. The GreenScapes Live Wall is remarkable. The 30-foot tall wall of plants has integrated irrigation, the result of the expertise of the skilled GreenScapes landscaping crew, designers and landscape architects. The Live Wall not only looks spectacular; it also cleans the air of CO2 and pollutants. The horticulture experts and landscaping staff at the conservatory change the plants regularly to create different thematic exhibits. During January to March 4, 2018, the theme is Orchids: Utopia. In May 2018, the Franklin Park Conservatory and Botanical Gardens will dedicate the Scott’s Children’s Garden. The Bill Gerhardt Family Foundation is donating the Forecourt Entry Garden, and GreenScapes Landscape Company is the sponsor for the Ohio Woodlands Garden. Whatever the future landscaping projects will be, one thing is certain. Bill and GreenScapes will continue to donate their time, their landscaping expertise, and their whole-hearted love to the conservatory and its programs.